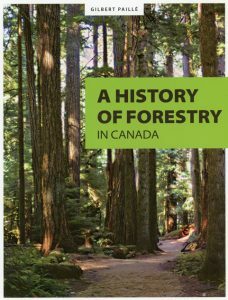 “A History of Forestry in Canada” book offer. All FHABC members (and members-to-be) are eligible to receive a copy of Gilbert Paille’s 2013 book “A History of Forestry in Canada.” Anyone who becomes a member of the association before June 15 is welcome to take advantage of this book offer. Thank you to the Société d’histoire forestière du Québec, for making these English books available! While the book itself is free, there is a modest fee to cover postage. For residents of Vancouver and Victoria this is $4 (the cost of bulk shipping all the books from Quebec City to the lower mainland). You must pick up your book in person in either Vancouver or Victoria on a June date to be announced. Members elsewhere in BC will unfortunately also have to cover the additional postage from the lower mainland to wherever you live. So, your book will cost $24 (shipping from Quebec to lower mainland+ shipping from Victoria to you + bubble mailer). Still a good deal as the book itself sells for over $40 in stores. We are happy to accept payment for postage by cheque or as an electronic interact transfer. Payment is due by June 15. Before sending your money, please contact Richard for the pass phrase to secure the funds. Your financial institution may apply a modest service fee for this transaction.